Like in her previous novels, Robyn lures readers into an intriguing world of lifelike imagery and memorable, colorful characters. The story is robust with suspense, romance, tragedy, humor and elements of the supernatural intricately woven into a series of well-conceived plot twists guaranteed to leave readers spellbound long after the last page is turned. 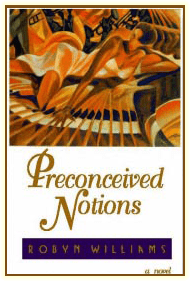 A Fool’s Paradise reveals the story of Dr. Aaryn Jamison, one of the nation’s most prominent African American physicians. She is brilliant and immensely successful and has a penchant for mountain climbing. Enter Jayson Denali, internationally acclaimed Academy award-winning actor. The handsome, charismatic, potently virile male superstar rose from meager beginnings to become king among Hollywood’s elite. He is the talented A-list movie star that every director covets and every woman fawns over. The complete antithesis of Aaryn Jamison, their personalities, temperaments and egos clash from the moment they meet at Shriners Medical Center where Jayson’s mother is admitted for long-term rehabilitation. Repulsed by what she sees as Jayson’s vanity, bravado and conceit from widely publicized accounts of his womanizing behavior, Aaryn wants no contact with the brazen superstar and abruptly refers the Denalis to another physician. Appalled by Aaryn’s objectionable and perceived arrogant behavior, Jayson is only too eager to leave the hospital in pursuit of another medical facility. Fate, however, intervenes and plunges the two down a startling road of self-discovery fraught with meddling parents, scheming ex-lovers, jealous co-stars and an ever-watchful, over-protective entourage. Passions simmer as forces conspire for and against the destinies of these two diametrically opposed individuals. Equally compelling is the unexpected and vivid depiction of the powerful and mysterious nature of the supernatural at work in the character’s lives. A Fool’s Paradise is storytelling at its best. Robyn Williams illustrates with compassion and intensity a beautiful story laced with seduction and sensuality so skillfully crafted that no reader will be able to resist this unbelievably cinematic tale. Savor the richness, enchantment, and emotionally infused chemistry of genuine relationships of the heart, for A Fool’s Paradise is as complex and inspiring as the real world it parallels. This poignant novel explores the imperfections of people, relationships, friendships and families. 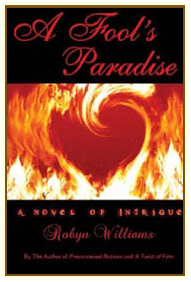 Perhaps Williams’ best work, A Fool’s Paradise is a powerful transition into mainstream fiction. It is a literary treasure and a must read for any mature, sophisticated reader’s collection.